The UK government has rejected newspaper claims chemicals exported from Britain after the uprising in Syria began could have been used in the production of agents such as sarin gas. The Sunday Mail story has prompted Scottish Labour and SNP MPs to call for an explanation from ministers. It comes after the US says it has evidence sarin was used in a deadly attack in Damascus last month. The Department for Business says the exports never made it to Syria. A spokesman said the export licences - granted for potassium fluoride and sodium fluoride meant for use in aluminium shower products and toothpaste - were also revoked after EU sanctions was introduced. According to the Sunday Mail, the UK government sanctioned sales of the chemicals in January 2012, 10 months after the civil war in Syria started. Toxicology experts told the paper that fluoride is key to making nerve agents but said the chemicals can have innocent uses. Labour's Thomas Docherty, who sits on the Commons Committee on Arms Export Controls, said he intended to table parliamentary questions demanding to know why the licences were granted and to which companies. "At best the government has been reckless and at worst negligent to permit the export of material that could have been used to create chemical weapons," he said. Meanwhile, SNP Westminster leader Angus Robertson said: "This is utter hypocrisy from the UK government - deploring chemical weapons in public whilst approving the sale of items needed to make them. "I will be raising this at Westminster as soon as possible to find out what examination the UK government made of where these chemicals were going, and what they were to be used for. "We need to know who these chemicals were sold to, why they were sold, and whether the UK government were aware that the chemicals could potentially be used for chemical weapons." A government spokesman said the UK operates "one of the most rigorous arms export control regimes in the world, and has been at the forefront of implementing an international sanctions regime on Syria". He added: "In January 2012, we issued licences for sodium fluoride and potassium fluoride. The exporter and recipient company demonstrated that the chemicals were for a legitimate civilian end use - which was for metal finishing of aluminium profiles used in making aluminium showers and aluminium window frames. "Before any of the chemicals were exported, the licences were revoked following a revision to the sanctions regime which came into force on 17 June 2012." The UK and US has blamed the Syrian government for the 21 August attack but Syria's President Bashar al-Assad says opposition forces were responsible. On Thursday, MPs in Parliament voted against the principle of taking military action and the foreign secretary says ministers have ruled out a re-run of the vote. US President Barack Obama has vowed punitive action but wants Congress to vote on it first. 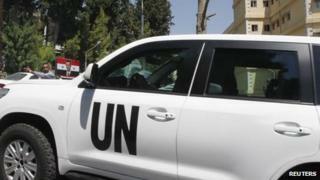 UN experts have been gathering evidence in Syria to determine whether chemical weapons attacks have taken place on various occasions. They have now arrived in the Netherlands with samples for analysis.